Flipping through a Victoria's Secret swim catalog is a surefire way to commit one of the seven deadly sins: envy. 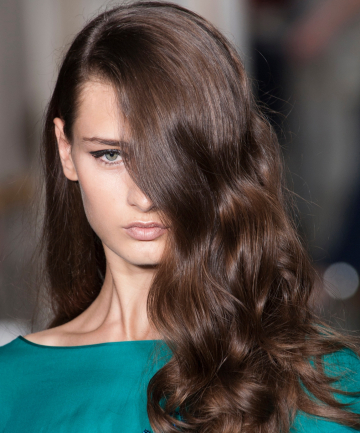 There's much to covet, but the one thing we want is the models' perfectly tousled wavy hair. Though we can't tell you how to get a VS Angel's body (or amazingly hot-in-pirate-attire actor husbands), we are absolutely sure about one thing: How to get tousled hair. See how to tousle your hair now. While this hairstyle has always been the classic go-to for beach hair, today it has become as pervasive as bellbottoms in the '60s. Virtually every celeb has tousled her hair for the red carpet, and the queen of pop, Beyonce wore it in her hot "Run the World" music video. That's good enough reason for us. So we went to celebrity hairstylist Eli Thomas, owner of Thomas Chance Hairdressing in Santa Monica, Calif. to give us step-by-step how-tos for every hair length, whether it's short, medium or long. All you need is a blow dryer, some tousling hair products, an appropriately sized curling iron, or just bobby pins depending on your hair. Maybe you don't have your own personal lighting director and wind machine following you around, but one thing's for sure: you can have tousled hair — with or without Victoria's Secret. Learn how to make this look your own now. These are pretty good tips, though I can never use the bristle brush, but I like the idea of no curlers. For my hair though I use 2" curls and spritz and they settle with 15min and I spritz again. I'm gonna try the mini buns and I hope they work. Never though it would work because I'm not a fan of the blow dryer. Whole story is very usefull! I'm going to give it a try! Looks easy, but we will see. I have really fine hair and not a lot of it! Wish me luck! I use the diffuser on my long hair. The mini bun tangled my hair. i have medium length hair so i tried the mini buns to get my naaturally wavy hair to look more defined. It came outhorrible. Great article! My long hair is naturally curly, so I have to tame it down to achieve this look. Definitely worth trying!